pic-nic, n. 1. A pleasure outing at which a meal is eaten outdoors. Imagine yourself, nestled on a soft cloth spread out on the ground, underneath a shade tree. You and your baby are nibbling on crusty french bread and sharp cheese, and sipping on iced Chablis. soft summer afternoon communing with nature. Get the picture? Great! Why not do it? Gosh, we love picnics! Doesn't everyone? Okay, so it may be hard to get him to agree at first. But if you learn the old-fashioned art of romantic picnicking, and treat him to a tasty one, he'll love it, too. He may even become the instigator! Later on this page we present the secret menus with recipes for four fantastic and romantic picnic adventures. And don't miss the cool Cheese Primer! Wait a moment! First, we've got a treat for you. 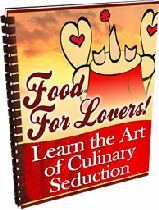 We've finally published our most excellent new cookbook, titled "Food For Lovers!". Although impromptu picnics, using leftovers from your 'fridge and store-bought potato salad have their place, the most memorable picnics are the result of preparation beforehand and attention to detail. Picnic foods should complement the mood: light but satisfying, with delightful and unexpected accents. BUT WHERE SHALL WE DINE? You don't need to get fancy with supplies (at first). All you'll need is two containers to transport your food and utensils to the scene. One is a cooler with ice in it. It's important to keep perishables properly refrigerated to prevent spoilage (and dangerous illness). Especially vulnerable are meats, fish, eggs, mayonnaise, and dairy products. satisfying way to enhance romance ! Picnic World... where shipping is always free! gift. 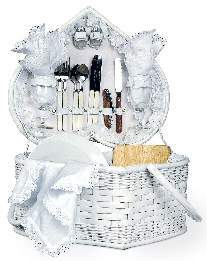 Check out their selection: Unique Picnic Wedding Gifts. We now present some great picnic food ideas & recipes. All items with (*) have complete free recipes included. Just click on the link which follows the picnic plans below. 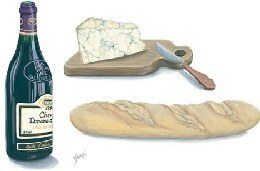 And check out our nifty Cheese Primer to explore some unique and soulful additions to your classic picnic menu. Pita pockets and/or flavored "wraps"